This past weekend we participated in a Sound of Art workshop run by the School of Noise at the National Portrait Gallery. 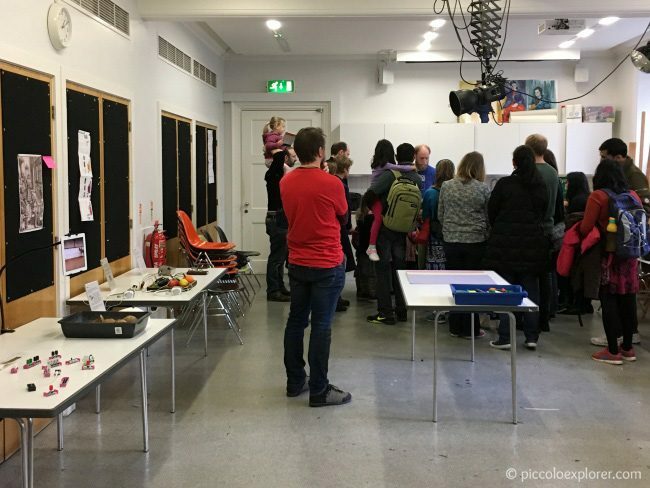 There were two free drop-in sessions – one for ages 3+ and one for ages 7+ – held on Saturday and Sunday. 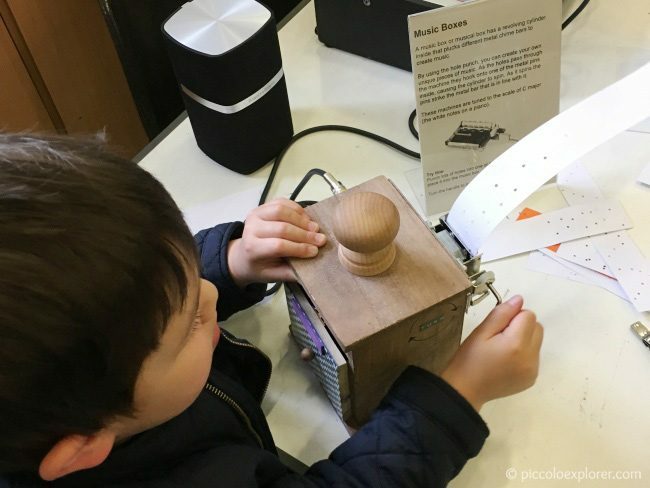 We joined the 1pm session for ages 3+, and it turned out to be a fascinating, interactive session for families to get hands-on and creative with sound using a variety of analogue and digital kit. The Sound of Art workshop was only running this past weekend at the Gallery, however, do keep an eye on the National Portrait Gallery’s Families Calendar for more interactive workshops and holiday activities that are coming up as well as the School of Noise website for more of their workshops. 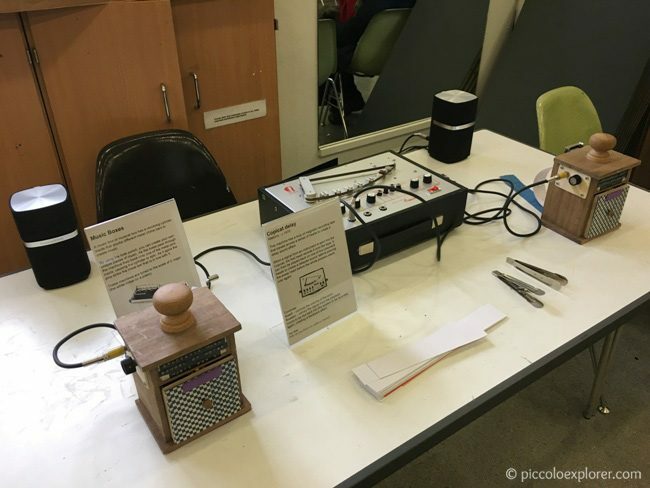 There were several stations set up around the room to learn how to use various sound making and sculpting machines, from telegraph keys to music boxes to tuning forks and more. One of Little T’s favorite stations was about creating Foley sounds – those everyday sound effects added to films, radios and computer games in post-production to enhance audio quality. A Foley sound artist would create such sounds as footsteps, clothes rustling, crockery clinking, doors opening and glass breaking. 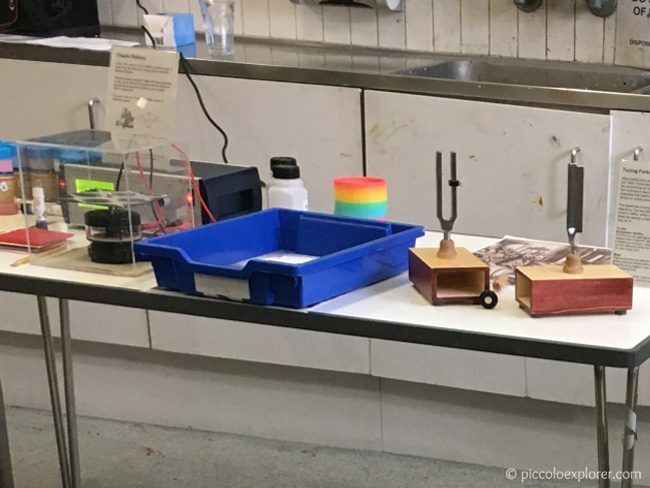 In this experiment, which was on the table in the background, we watched a video of a horse, with its rider, trotting around a sand-filled ring. There were coconut halves in a tray filled with sand that we used to create sounds like those of the horses’ hooves against the sand as it slowly trotted then quickened its pace. 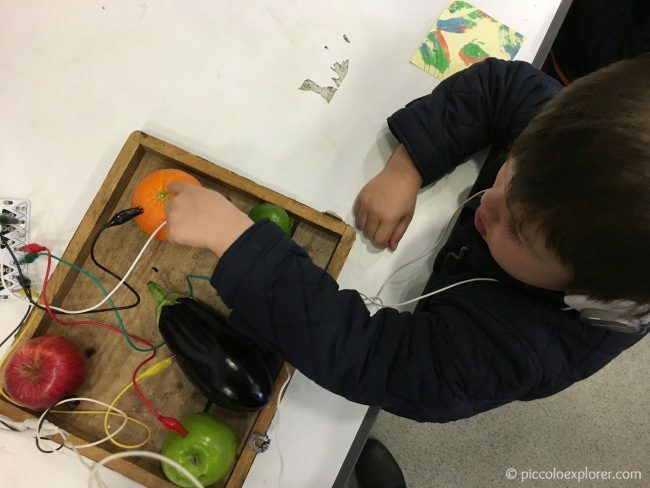 Little T also enjoyed the Ototo device that allows you to trigger different sounds by connecting anything conductive, such as metals or organic materials, to the kit using clips. When we touch conductive objects, a small electrical charge that we all carry passes through the object. The Ototo senses the change in electrical charge and plays the sound assigned to that input. 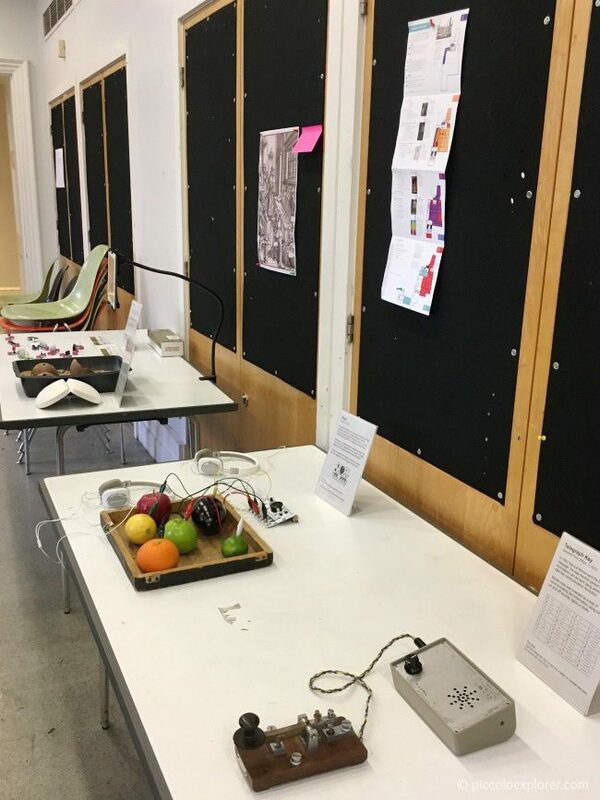 In this experiment, fruits and vegetables were connected to the Ototo, along with headphones, and as you tapped the food items, you could hear the sound through the headphones. There are also 12 grey touch keys on the device that each represent a musical note and allow you to select different samples to play. It was interesting to use a music box, which has a revolving cylinder inside that plucks different metal chime bars to create music. We were given a strip of paper to punch small holes into, then fed the paper into the music box with a crank. As the holes passed through the machine, they would hook onto one of the metal pins inside, causing the cylinder to spin, which would then cause the pins to strike the metal bar in line with it and create music. 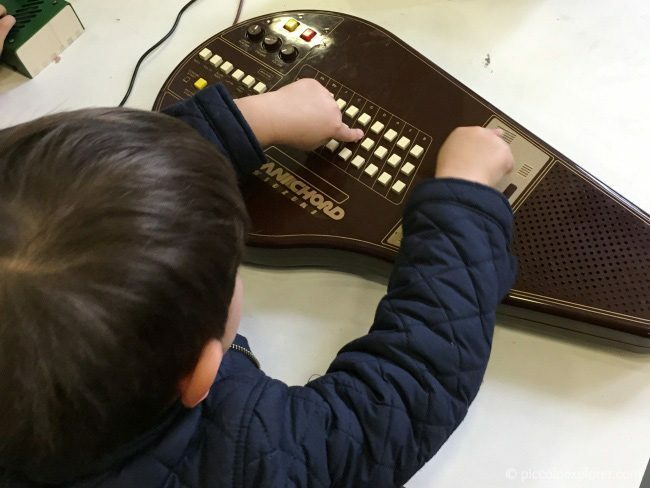 We took turns with other families using an omnichord and a rhythm machine that shared a table. Here we were basically tinkering around with the various sounds and rhythms you can make on the machines. On the omnichord, for example, you hold down a chord key and run your finger up and down the strumplate to create a sound. Lastly, I found the demonstration of Chladni Patterns very fascinating. A metal plate, sprinkled with sand and supported by a post in its center, was vibrated at a specific frequency, and the vibrations would then drive the sand to various points to create a pattern across the plate (not a great photo below but you can see the metal plate in the case on the left). There was a sheet showing the patterns that could be created and at which frequency. The children got involved by selecting a pattern and helping to set the frequency on the machine. It was interesting to watch the sand then move around the plate to create the pattern. The children could then recreate the pattern by drawing on a small square of paper, adding some glue and placing the paper into some colored sand. I was very impressed with the Sound of Art workshop. It was interactive and educational, with plenty for the children to get involved. The School of Noise staff were very helpful with demonstrating how each device worked and answering any questions. I’d definitely recommend attending one of their workshops. It was also a very popular session. There was a long queue to get in, so after about 45 minutes, our group wrapped up to let more families enjoy the experience. 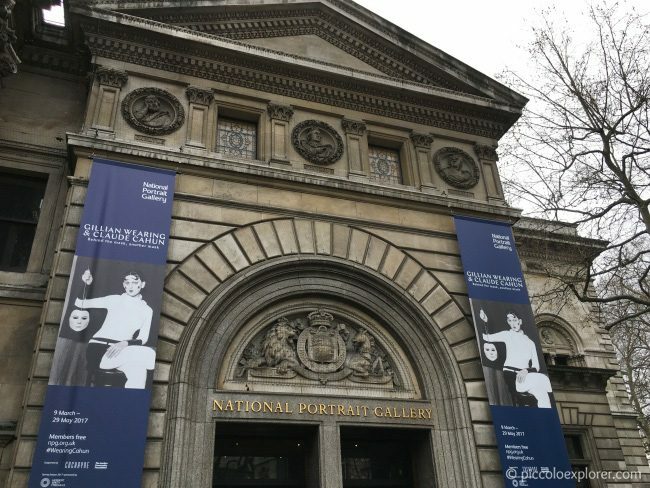 We had arrived early to the National Portrait Gallery and spent some time browsing the collection before the workshop. 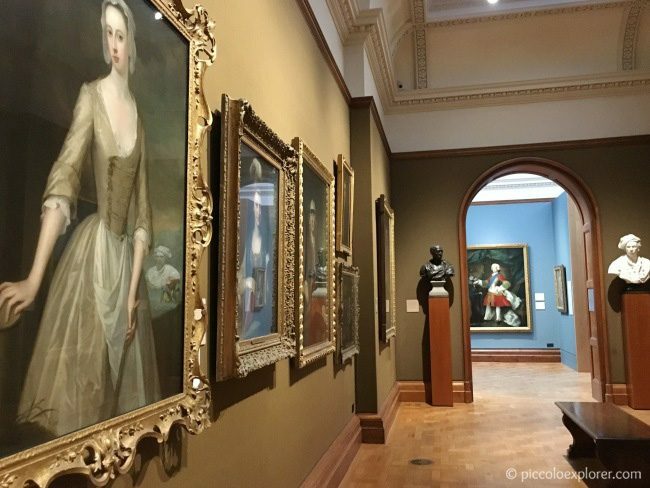 The National Portrait Gallery has the most extensive collection of portraits in the world, housing over 200,000 portraits of historically important and famous British people from the 16th century to present day, with around 1,400 portraits on display at any one time. We started on the 2nd floor, which is where you’ll find the oldest part of the collection from the Tudor period to the early 19th century. We had stopped by the Family Activity Base beforehand to pick up an activity pack and color pencils for Little T. He chose to make a 3D gallery to draw his own exhibition while we had a look around the collection. Other resources available at the desk, which is open during the weekend and school holidays, include a free drawing book and 3D portrait heads. 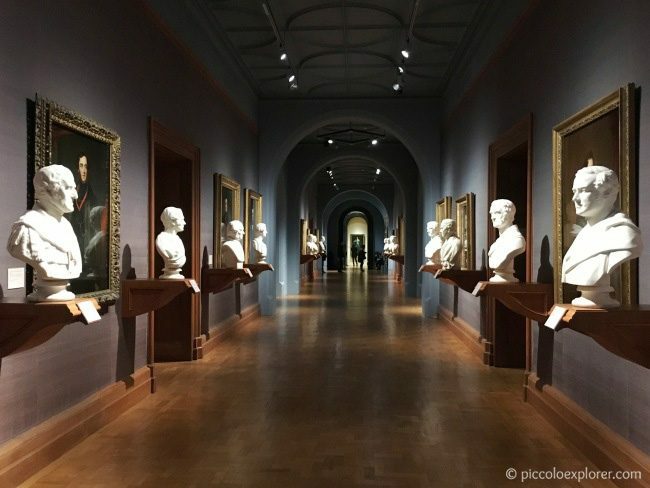 Victorian, Edwardian and 20th Century portraits are on the 1st floor, which also features the Statesmen’s Gallery – a long hallway lined with portraits and white marble busts of statesmen from the Victorian period. 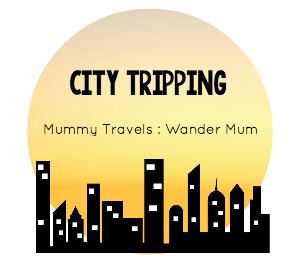 We only had about half an hour to browse the collection, however, combining our visit with the hands-on workshop for Little T worked well for us and I plan to return for another session. The next drop-in family sessions for ages 3+ is on 21 May: Portraits in Clay, and there are several other workshops for ages 5+ before then, including Family Portraits and Behind the Mask next month. 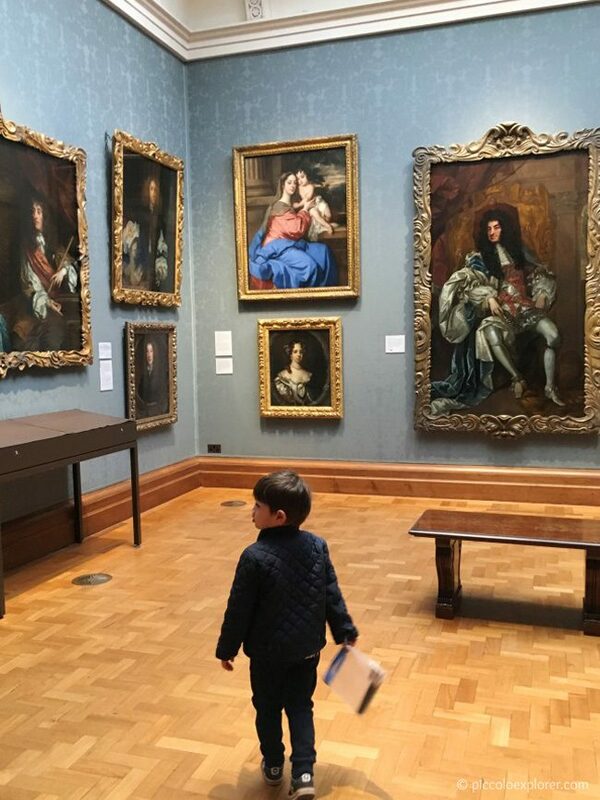 Overall, the National Portrait Gallery is a family-friendly place to visit, offering access to free resources and drawing materials, along with a calendar of family workshops and holiday activities. Tickets: Free admission to gallery. Some exhibitions require ticket purchase. What a fascinating post! We didn’t make it inside this art gallery but maybe next time!